Baby's First book has six simple, brightly coloured pictures. Each book is unique with a different set of pictures. This book is ideal for little hands that are just learning to turn pages, and also helps to teach first words. This is a perfect add-on to our Newborn Gift Set. The pages are are 100% cotton, while the pictures felt. All pictures are hand stitched. The book is 13x13cm, which makes it perfect for smaller babies. It is also washable, so baby can chew on it. 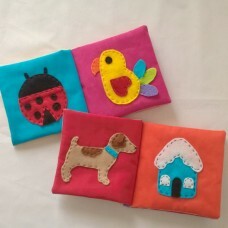 Cushions for babies' nurseries and kiddies'&n..